Despite the assertions of many loudspeaker designers that active loudspeakers are the future, and regardless of their considerable success in the pro-audio world, they just haven't caught on. The most obvious and probably most important reason is simply that most audiophiles don't like having their choice of amplifier dictated to them. Even if they're happy to take on trust the quality of amps fitted inside a speaker, they probably already own amps that they like and are loath to part with. At the very least you'll need some custom-made adaptor cables, as the SCM16A features only a balanced XLR input - a clear sign of its professional heritage. As is usual from ATC, the model number refers to internal volume in litres, so this is not a particularly large speaker. It is heavy, though, due not only to the typically chunky ATC bass driver, but also to the substantial toroidal mains transformer that feeds the internal amp. The enclosure is relatively light, being cast in aluminium along with the fairly gigantic heatsink at the back. Presumably, this cost a bit to tool-up, but it must make manufacture relatively swift and straightforward, and also means that overheating is never likely to be a problem as the enclosure also dumps waste heat from the high-biased Class AB amp. The latter delivers 200 watts into the bass driver and 50 watts into the tweeter, with an electronic crossover separating the frequency bands at small-signal level. The advantages of that are precision and the ease with which rapid crossover slopes may be implemented. ATC uses fourth-order slopes, limiting the out-of-band drive to each unit and hence reducing distortion: even faster slopes can have audible ringing effects for listeners placed off the ideal axis of each speaker. Build-wise, the amplifier is a straightforward affair, very robustly built on a circuit board mounted directly inside the enclosure. ATC makes all its own bass/mid drivers and this one is a six-inch unit shared with the SCM11. The unit's heavily doped cone uses constrained layer damping to reduce resonance and hence distortion due to cone break-up at higher frequencies, and its central dust cap doubles as a soft dome. The tweeter is a soft dome type, 25mm in diameter. In keeping with current curvy trends, the enclosure of the SCM16A is rounded off at the edges of the front baffle, and both curved and tapered towards the rear. While this won't eliminate internal resonance entirely, it is a good way of reducing its effects considerably while also reducing the severity of structural resonance within the enclosure. Aluminium is not the 'deadest' material around, but a quick check, tapping the side at various places, does confirm that, in this case, it offers very good performance. There is, of course, internal damping in the form of fibre wadding and the front baffle is made of thick MDF and pretty well damped by the combination of its interface to the bass/mid driver and the rest of the enclosure. There is no reflex port, ATC preferring sealed-box construction for all of its smaller models. Sensitivity is adjustable at the rear of each speaker, over a 20dB range (trim to suit your preamp), and there is also a bass-boost control that is quite subtle and intended as a trim rather than a tone control. Grilles are neither provided nor an option. There's nothing immediately obvious about this speaker that announces its active operation, and that's as it should be. Fed from a decent preamp or variable-output source, it's clearly a good - but perhaps not outstanding - standmount, that displays exactly the kind of traits you would expect in a speaker of this type: it's quite detailed, and the balance is okay. In this case, 'not outstanding' means that it doesn't leap out at you as wildly different from the norm. In terms of resolution from a mid-price speaker, this actually is quite outstanding, but you have to listen for a while to get it. Once one does, it's hard to stop listening. ATC speakers do tend to be good at detail - the SCM16A especially so. This is all the more impressive given how little fuss it makes about things. Occasionally, one comes across hi-fi components which practically assault the listener with detail, but the softly-softly approach is, in the long run, much more satisfying and we're delighted to find it here. Tonally, we can find little to criticise. The bass trim control is handy when setting up for the most natural results with sounds like plucked double bass and very low notes on the piano, and with past experience of professional monitors we are not surprised to find that the best way to set it up is to adjust upwards until its effect seems just audible and then back off a shade - only with speakers jammed into corners might it be completely unwarranted. The midrange seems very uncoloured, while the treble is open but never over-bright. The SCM16A can manage some impressive playback levels, and blasting out some rock'n'roll at high volume through them is a grin-inducing experience - despite the fact that ATC makes much larger models that are more naturally suited to such frivolity. The various modern styles of computer-generated music are rather less successful, as these often rely on a bit of 'character' in the loudspeaker to complete the music production chain. However, a well-mic'ed drum kit heard through the SCM16As is really quite something, with full-on impact and drive. Voices are often cited as a critical test of any loudspeaker and, again, the SCM16A performs well. There's one notably interesting effect though, which is that vocal recordings on the 'hissy' side seem unusually so with the SCM16A, even though its overall balance is, if anything, mellow - certainly when compared to many other current small to medium-sized speakers. We can only conclude that brighter speakers bring out the high harmonics in everything to a greater degree and render sibilance less obvious by comparison. Don't shoot the messenger and all that, but it seems worth mentioning, if only to warn against over-hasty judgements on that score in demonstrations. We've saved the best for last, though. 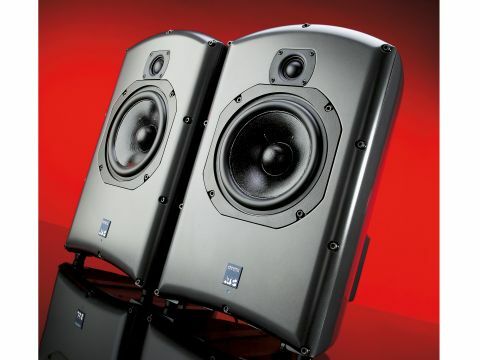 In terms of stereo imaging, this is one of the best speakers we've come across in a long time. Possible reasons aren't hard to find, but whatever the cause the SCM16A really pins down the sound sources within an ensemble. Width and depth are at once precise, stable and believable and that is the icing on a very tasty cake. If you've never tried active speakers this is, from every point of view, an excellent place to start.